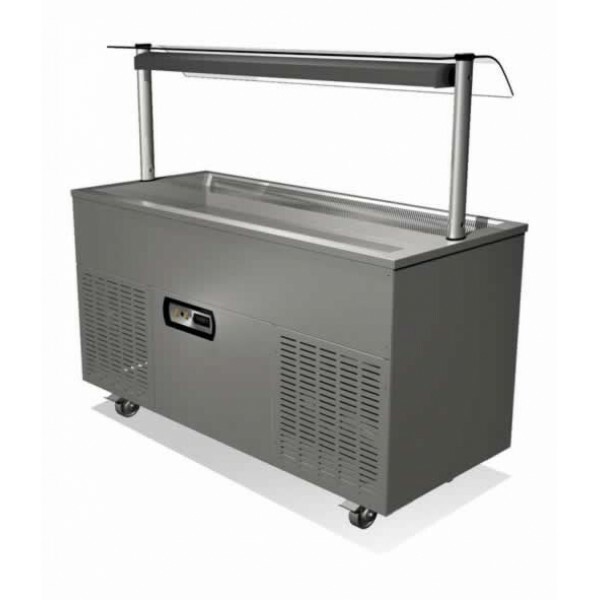 Ideal to be rolled into integrally into existing counter work or standalone as a central display This ICROLL5 mobile roll-in base unit has a capacity for 5 x 1/1 gastornorm pans and is designed to be used with the Counterline Integrale, Da Vinci and Manhattan drop-in displays. Additional finishes are available, please call for details. For use with Integrale, Da Vinci and Manhattan standard width displays. These units can be rolled integrally into existing counter work or standalone as a central display. The standalone displays require additional panels. See finishes below. Avoid lifting heavy units into position and simply resolve condensing unit airflows. Wide versions are also available on request. Roll-ins for heated displays have ambient storage. Roll-ins for chilled displays have full internal airflow ducting with inlet and exhaust on operator’s side, except for 2/1 which has air inlet on customers side and exhaust on operators side. Customer side is Zintec as standard. Stainless or laminate fascia panel available as optional extra. All units mounted on four 100mm diameter castors, two lockable. The image shows the ICROLL base unit with Integrale drop-in well option. This unit must be purchased with a Counterline Intergrale, Da Vinci or Manhattan or drop-in unit.